Creating a benchmark by selling over 600,000 units of SLK since 1996, Mercedes marked an impeccable glory for the roadsters. 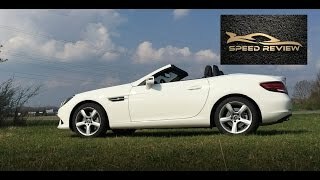 To replace the predecessor they are now back with the all new Mercedes-Benz SLC 2017. The model has a redesigned bumper and some extra new features that take it a step ahead of its ongoing sibling. Let us have a look at the review of Mercedes Benz SLC 2017 to know in detail about the specifications and performance figures of them model. The interior of Mercedes Benz SLC 2017 has been redesigned to deliver a fresh look and better experience. Let us first talk about the similarities between the new model and the one it replaces. While on one hand the center console, seats and door trim panels keep the same essence but with a change that makes them look bit better, the infotainment screen carries similar four-spoke vents on its either corner. The same air vents can also be noticed on either corners of the dash. The instrument cluster also gets bit of refinement with two primary gauges sitting over the upper portion and two secondary gauges housed on the lower right side. The interior gets marvelous blend of aluminum trim while the 5.8 –inch touchscreen that we had in SLK now gets bigger and better with the seven-inch glory. Apart from these there are options to go with ambient lighting package and have additional leather colors. Concluding the interior details of Mercedes Benz SLC 2017 I would lastly mention the electro hydraulic roof which can be open and closed at speeds of up to 25 mph. The exterior of Mercedes Benz SLC 2017 is a fresh new design work by the company. Starting with the front fascia the model features the traditional diamond grille finished in black with chrome trim and an iridium silver louver. The eyelid-like headlights are integrated with LED daytime running lights and add commendably to the front looks. Moving towards the sides there are subtle changes that make the model look different from the model it replaces. The side features a smooth body and is decently wrapped around body line. The rear end has the same fender vent while the center louver now terminates inside the vent giving the rear fascia a cleaner stance. 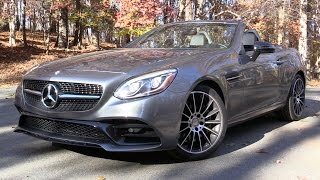 In all the exterior details of Mercedes Benz SLC 2017 primarily revolve around some decent looks that ditch the power it carries beneath its hood. Beneath the hood of Mercedes Benz SLC 2017 are four power options coming through four different trims; SLC 180, SLC 200, SLC 300 and SLC 250d. Beneath the hood hides four-cylinder engines displacing 1.6 liter, 2.0 liter, 2.0 liter and 2.2 liter respectively. The engine crank total output of 156 hp, 184 hp, 245 hp and 204 hp respectively and peak torque of 250 nm, 300 nm, 370 nm and 500 nm respectively. 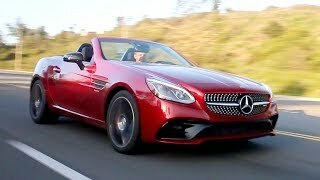 The performance figures of Mercedes Benz SLC 2017 touches the top speed of 223 mph, 237 mph, 250 mph and 245 mph respectively while the 0-62 mph sprint can be knocked in 8.1 seconds, 6.9 seconds, 5.8 seconds and 6.6 seconds respectively. The figures mentioned above are when the engine mates to 9G-Tronic transmission which is standard for the latter two but comes as an option with the former two.